We’re sorry to hear the sad news that Carl T Ford has died. He was the young editor of Dagon, an excellent journal of fantasy and horror literature which ran for 27 issues from 1983 to 1990. Always well-designed, and full of high quality content, this was one of the highlights of the small press in that period. Carl's enthusiasm and knowledge gave the magazine a great spirit. 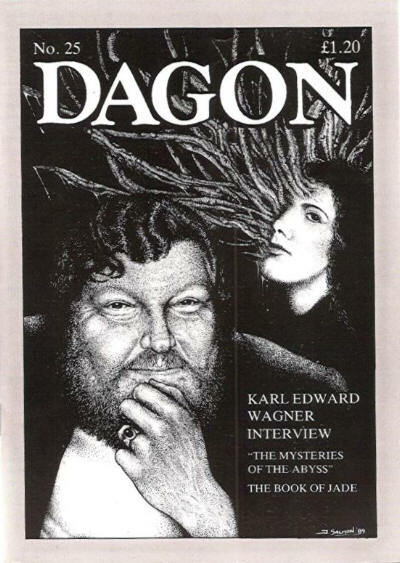 Carl had started Dagon as a zine devoted to the role playing game The Call of Cthulhu, but from about issue 12 decided to develop it so that it covered Lovecraft, Machen and weird fiction generally. It published several early pieces by Thomas Ligotti, and issue 22/23 (1988) was a Thomas Ligotti special issue devoted to him. There was also a special issue, 18-19 (1987), devoted to T E D Klein, one of the first places to offer studies of this author’s fine fiction influenced by Machen and Lovecraft. Other contributors included Neil Gaiman, Ramsey Campbell, Brian Lumley, S T Joshi, Mark Samuels, D F Lewis and Mark Morrison. Carl also published my own first essay on Park Barnitz’s The Book of Jade, among other pieces. Carl was a friendly presence at the British Fantasy Society conventions in the Eighties, slightly fragile looking but often seen in vivid paisley shirts rivalling those of the late Joel Lane. After he gave up Dagon, because of the sheer amount of work involved alongside a day job, we stayed in touch for a while and I remember Carl telling me he was now involved in something quite different – greyhound racing, with his own greyhound. I heard from Carl again after what must have been around 12-15 years because he was planning either to revive Dagon or to start a new magazine in the field, but unfortunately I think his ill-health prevented this from going any further. The Yog Sothoth website has a thoughtful interview with Carl here.